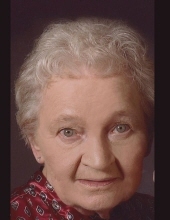 Mary Louise Lee, 88, passed away Sunday, March 24, 2019 at her home, which was an appropriate time for her to meet her Heavenly Father. She was born in Henryetta, Oklahoma on October 14, 1930 to Fred and Mattie Lee. Mary was raised in Shidler, Oklahoma where she met Warren (Spud) Lee. They were married and had four children who were each 13 months apart. Spud worked for Phillips Petroleum Company, and was transferred to Iowa Park, TX in 1962. He was later transferred to Oklahoma City, where he was the field supervisor for the OKC well service division. Mary worked at Waukesha-Pierce as a secretary. From a very young age, Mary was encouraged by her father to play the piano. She began playing at church at the age of nine. She was the pianist for Beverly Hills Baptist Church until her illness. Mary was preceded in death by her husband, Warren Lee, and her husband later in life, Clyde Hale. She also lost her oldest daughter, Mickey Lynn McDaniel-McCarty from cancer, a grandson, Kurt from an accident and a granddaughter, Jordyn, also from an accident. Her survivors include her daughters: Janie Clinkscales and husband, James of Keller, TX; Kay Deem and husband, Clay of Oklahoma City, OK; son, Tony Lee and wife, Sarah of Sidney, MT; eight grandchildren and fifteen great-grandchildren. To send flowers or a remembrance gift to the family of Mary Lee Hale, please visit our Tribute Store. "Email Address" would like to share the life celebration of Mary Lee Hale. Click on the "link" to go to share a favorite memory or leave a condolence message for the family.